I get it. Sometimes it takes a bit – but I get it now. I mean, I understood in theory what the American Cancer Society meant when they came out with this slogan, but today it really hit me. Today was it – the “take two” for my little girl who was shut out of the Susan G. Komen Race for the Cure in September because of a fever. This was her chance to walk with Mom and Grandma. She even got the added bonus of having Dad with us this morning. Living where we do, an event like this seems to bring out just about everyone, and it was hard to take two steps without bumping into someone we knew. It was also almost impossible to look anywhere and NOT see one of those pink survivor sashes. I saw them on women of ALL ages – from the frighteningly young, to the admirably old, and it got me thinking. Before my mom had her cancer, she could have sometimes been caught cringing at the sound of “50.” After a double mastectomy, 6 months of chemo, and in the middle of 5 years of tamoxifen – she embraced 50 with a smile, and slid gracefully past 60. “Beats the alternative,” she often says. As I stood there, I thought about the “previvors” I have “met” on the internet and from this blog. They have courage of a type no other can quite get. The courage to undergo a prophylactic bilateral mastectomy is not to be understated. I am impressed at the maturity of the very young, and the wisdom of those closer to my own age. But, I was struck, somewhere in between the quick math that left me knowing the young lady on the T-shirt had been 23 when she died of breast cancer in 1994, and that my own girl will be 23 in 14 years. Suddenly it didn’t seem that long, and I was afraid. My little girl will grow to be 95 I reassured myself. With the power and knowledge we have – she will know lots more birthdays. But the reality that my mom had cancer at 48, and I had it at 38, and the current screening recommendations are to screen 10 years before your closest relative had the disease, well – it made it hard to breathe for a few minutes. Then my husband reminded me that she has ALREADY been screened – twice. We will be vigilant. And then I thought about my own. I will turn 39 next month. That is the age some people like to stay at forever. NOT ME! I want MORE BIRTHDAYS! 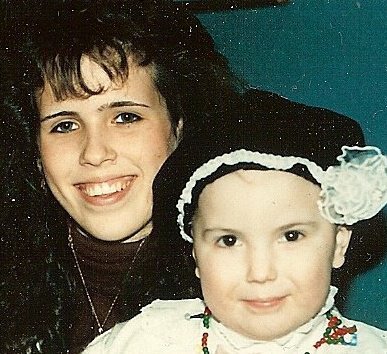 My beautiful cousin Meghan died of Leukemia in 1991, on my 18th birthday. My cousin Meghan was a brave soul. She was diagnosed with Leukemia when she was 2. She fought for 4 years before the disease took her from us. She got her wings the day I turned 18, and every birthday since then has been bittersweet. We had a connection that I still find it difficult to describe. My love for her was deep enough, that I needed to name my daughter for our “Angel Meghan.” Meghan did not have enough birthdays. This may be the year that I look at mine a little differently. Maybe its time to use my birthday as a time to celebrate BOTH of our lives. We left the walk a little early this morning. We had to head out to Long Island. 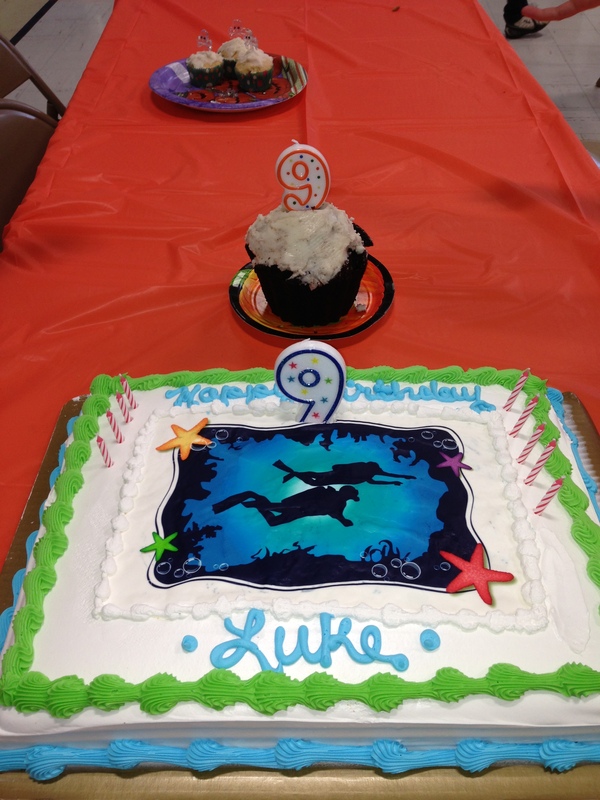 My nephew Luke was celebrating his 9th birthday today. And as the kids played, and the candles got blown out on the cake, I found myself really sure that I understood. As my sister said just an hour or so ago… It’s not about the gifts. It’s about the people you celebrate with. 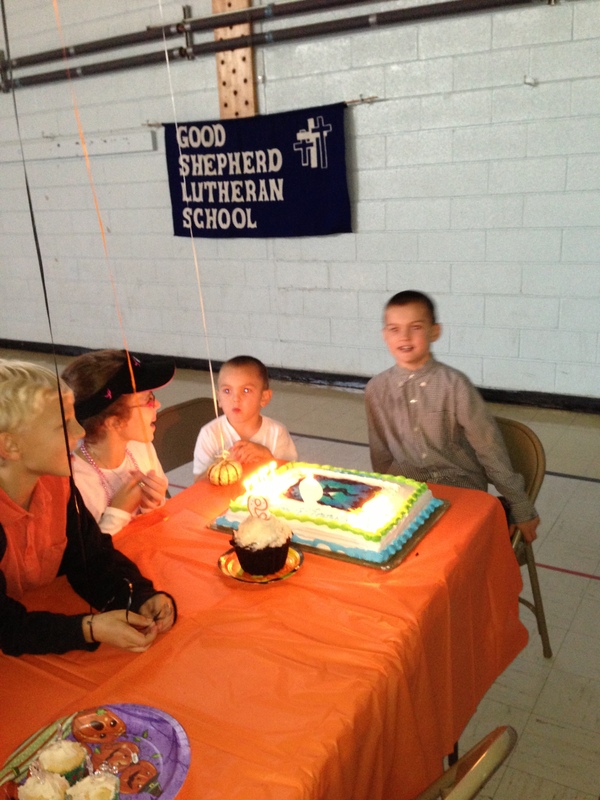 We celebrated Luke’s birthday with 3 GREAT grandparents, and 4 of his grandparents. It’s easy to fight for more birthdays when you are this blessed. Previous Siri, my new BFF! Oh Lori, you are such a great writer. Every year we are on the board for our local Relay for Life. 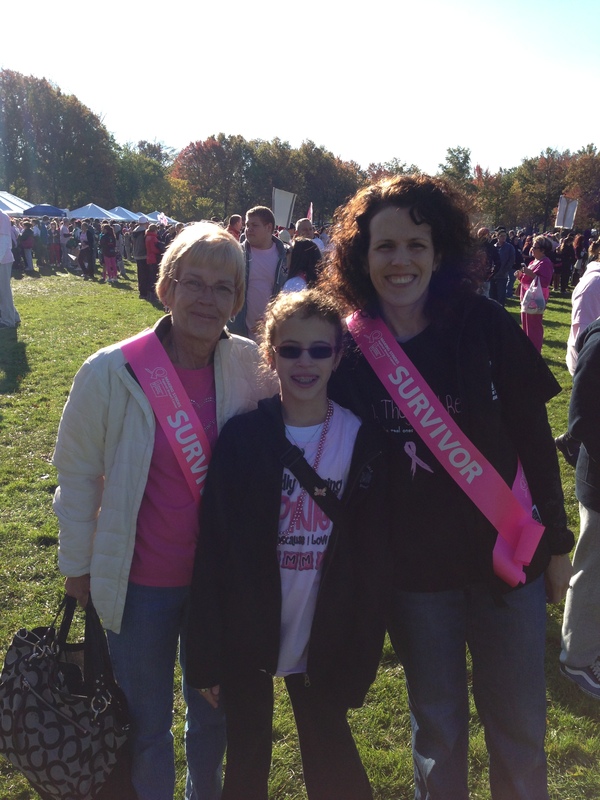 Every year (except this one), I have to watch both my daughter and my mother walk together in the survivor lap. Last year my mom passed and Katie walked with a friend from Camp Ronald McDonald. 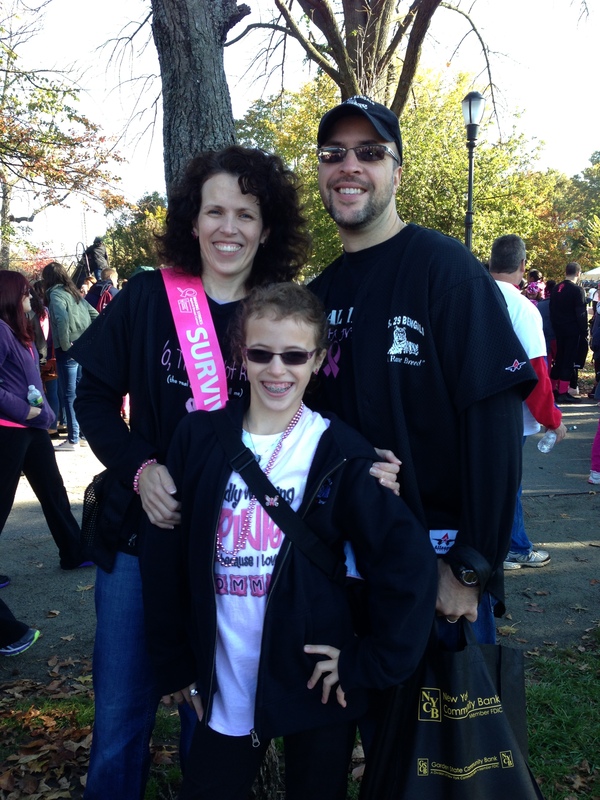 Every year, I just sob as I watch her walk because it just kills me that my daughter qualifies to walk as a survivor. I cannnot imagine how your darling husband watches his daughter, his wife, and his mother in law…… Our girls just shouldn’t qualify for such a thing – it is just crazy wrong……. Of course you and your mom shouldn’t either, but when they are so young ,it just seems more horrific…… But every year we do it because it’s is our way of helping to make more birthdays. Katie and I are actually in the national American Cancer Society commercial on tv (in a crowd so you can’t really make us out), but we’re in it! I am so inspired by your journey and congratulate you for your success! 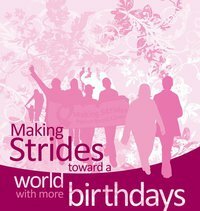 I, too, am a supporter of the American Cancer Foundation and have been trying to find business owners to support it. I actually have a great program that allows businesses to set up their merchant processing systems to make direct donations! If you or anyone you know is interested in leveraging this product, send me a text. Text ‘Amanda.Hines’ to 55469 without the quotes.